Description : This leather notecase, crafted from Italian Tamponato, has two note compartments and two side pockets. The RHS has a zip coin pocket and a slot for a card. The LHS has a flap with a net window for your driving license. 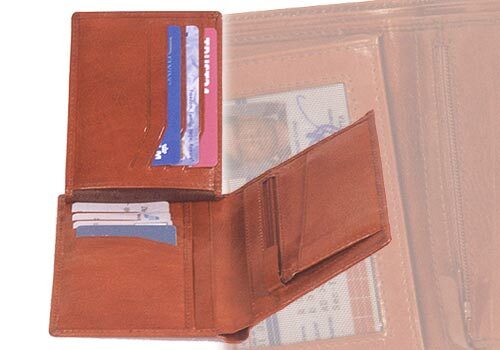 Behind the flap there are four credit card slots and, beneath it, an additional five slots for cards as well as a side pocket. The colours available are Black, Brown, and Burgundy & Blue.